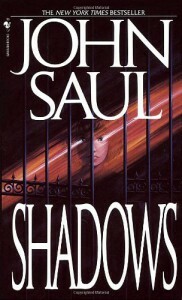 I'm finished with Shadows: Reading through Saul's books that I have yet to read i decided this time on Shadows. The one thing i majorally like about John Saul's books is that no one idea is the same and he always has a fresh new story to tell. Shadows is definatly one of the more original storylines i have read. I enjoyed this alot and hope he may write a sequel to this certain story some time in the near future.